As you know, I'm a lover of historical fiction. I really enjoyed author Jocelyn Green's first book The Mark of the King a year ago. 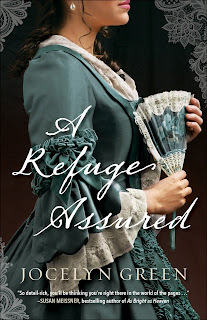 When I saw A Refuge Assured come up for review, I jumped at the chance. I haven't read many books that are set or based in France. 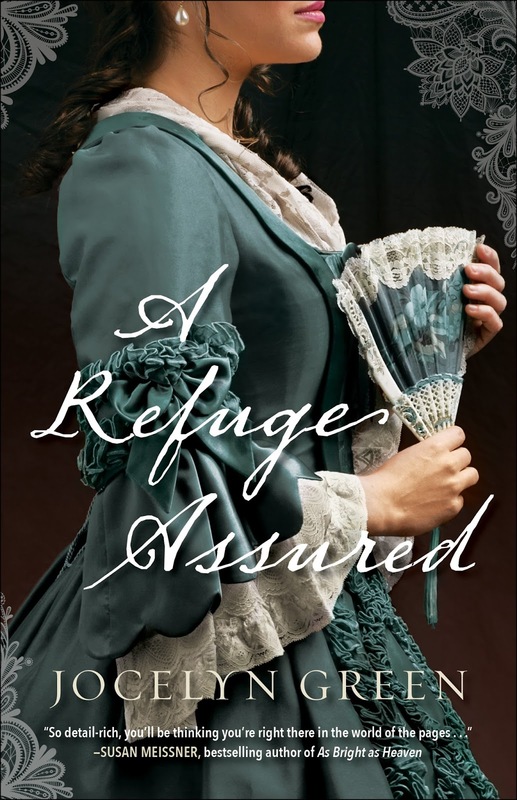 My hope was that A Refuge Assured would be similar to The Mark of the King. While it's begins in France and the characters make their way to the United States, that's where the similarities end. This time refugee, Vivienne Rivard ends up in Pennsylvania instead of the south. Vivienne is able to escape France during it's tumultuous revolution. She ends up completely alone and penniless. All she has to help her get started with her new life is the lace she was able to smuggle out of France. Vivienne takes a job at a boarding house by learning how to bake. One of the women who has a room next to her also has a little boy, and it turns out he may be the next king of France! As people begin to think Henri could be the hidden king, Vivienne ends up taking care of him and seeking refuge in the small town of Asylum. Before escaping there, she had taken a new job that introduced her to Liam. He wants to live a simple life on his farm, but everything seems to be conspiring against him to not allow that to happen. Liam helps Vivienne and Henri get to Asylum, but things don't go quite as planned. While I liked the story, some parts didn't work for me. First the author goes back and forth with using Vivienne and Vienne, sometimes 2-3 times on the same page. It took me a little bit to figure out it was the same person. The start and stops with the chapters were kind of rough for me. It seems like very different writing from the first book. Jocelyn Green inspires faith and courage as the award-winning and bestselling author of numerous fiction and nonfiction books, including The Mark of the King, Wedded to War, and The 5 Love Languages Military Edition, which she coauthored with bestselling author Dr. Gary Chapman. Her books have garnered starred reviews from Booklist and Publishers Weekly, and have been honored with the Christy Award, the gold medal from the Military Writers Society of America, and the Golden Scroll Award from the Advanced Writers & Speakers Association. She graduated from Taylor University in Upland, Indiana, with a B.A. in English, concentration in writing. Jocelyn lives with her husband, Rob, and two children in Cedar Falls, Iowa. Visit her at www.jocelyngreen.com.